Everywhere I go, I run into people who have a personal connection with Alzheimer’s disease. While I am certainly more aware of the disease these days having now been employed with the Alzheimer’s Association going on 7 years, it wasn’t always this way. I’ve always had an affinity towards seniors as my own maternal grandmother; my Lola, helped to raise me. I love the stories. The way their eyes sparkle when the memories that they have for what adventures they played a part in came flooding back in when you are in conversation. She was the only living grandparent left when I was born. Her presence in my early life has played a huge part in how I live my life today. I first experienced this horrible disease in 2006 when a member of my ex-husband’s family was diagnosed. That coincided with me starting a new career in the senior healthcare field. As I tried to navigate both the new job and the part I would play in my extended family’s plight, I soaked in the information given to me and was led to a support group held in the same facility that I started work in. I came across the spouse of a resident in my facility that led that support group. He was and continues to be an integral part of the Alzheimer’s Association. Through that connection, myself and my extended family became a user of services; services that were a lifeline in the sea of uncertainty and grief when you feel alone and proud; not wanting to ask for help. As the years went by, we lost quite a few members of that generation in my ex’s family and I learned later that several members of my own family have had diagnoses of dementia and Alzheimer’s. Today, I am grateful that I have the knowledge and the background, a wealth of services and people to call on when I am faced with challenges in activities of daily living. I walk for my family. I am an only child and I want the legacy I leave to make an impact. 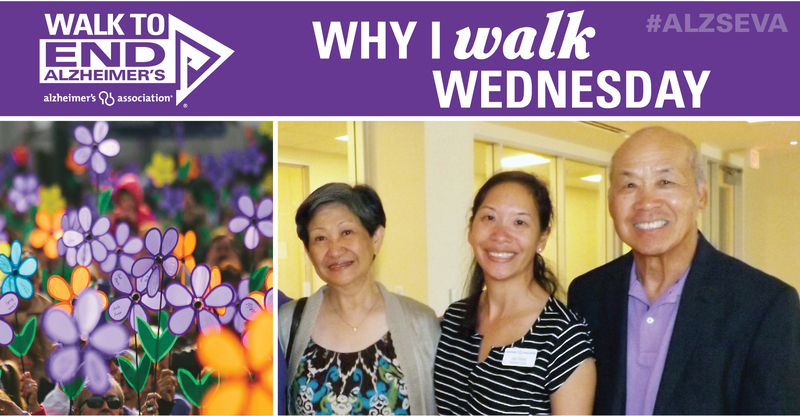 I walk for families who feel pressured by cultural restraints and don’t know that we are here and how much (we) the Alzheimer’s Association can help. I walk for people who have been diagnosed without families to care for them. I know that we are closer than we think to something that will break open the way we treat, prevent and possibly cure Alzheimer’s in the next few years. That’s huge. Bottom line, I walk for my family and yours. We are all in this together. Memories are all we have of one another. Let’s make this a good one.